Suzuki is now attacking the hated golf industry. 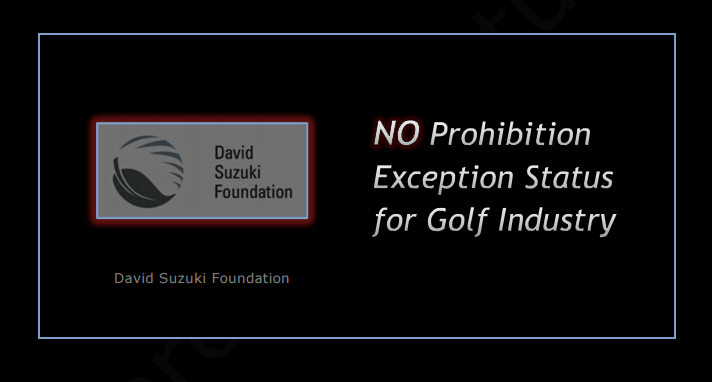 Suzuki, with his fanatical-operatives, are attacking the golf industry in every manner possible. The #@! !% Suzuki-Documentary, « Dad and the Dandelions », which first aired on March 2nd, 2017, represents the boldest anti-pesticide attack against the golf industry. These attacks will never, NEVER, end ! Because David Suzuki hates golfers and despises the game of golf ― this is a fact that has been documented for over a decade. What is Suzuki’s objective ?!?! To attack and destroy the golf industry with LIES about cancer. 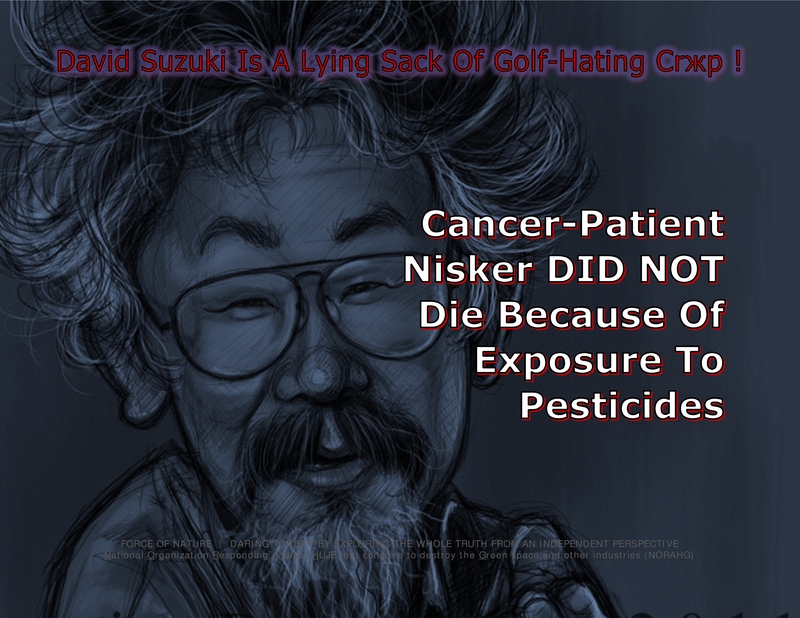 Suzuki and his operatives are science-deniers, golf-haters, and pesticide-phobic ! Through their LIES, David Suzuki and his fanatical-operatives have self-designated themselves as the opposition to Health Canada and to every other science-based national government regulator in the world. The #@! 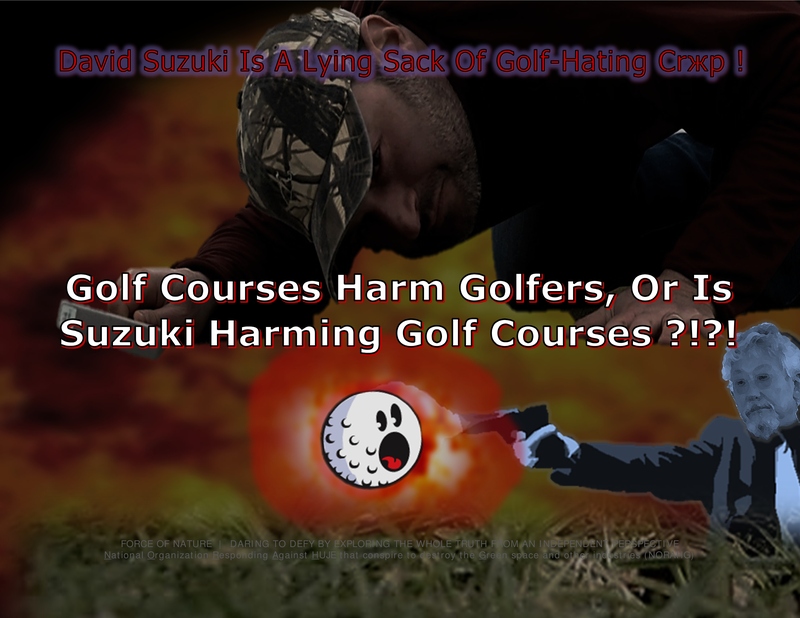 !% Suzuki-Documentary, « Dad and the Dandelions », LIES about golf courses and LIES about cancer. These LIES are concocted despite overwhelming scientific evidence from Health Canada clearly demonstrating that pest control products are scientifically-safe, and DO NOT CAUSE CANCER. Unfortunately, Suzuki and his operatives have shown that they are unwilling to process, or incapable of understanding, any scientific evidence whatsoever. They could not care less about ANY facts. It is far easier to LIE and LIE and LIE and LIE. They LIE about health issues. They LIE about golf course maintenance. They LIE about golf courses harming golfers. Do golf courses cause cancer ?!?! NO ! That is a LIE ! Is golf making people sick ?!?! 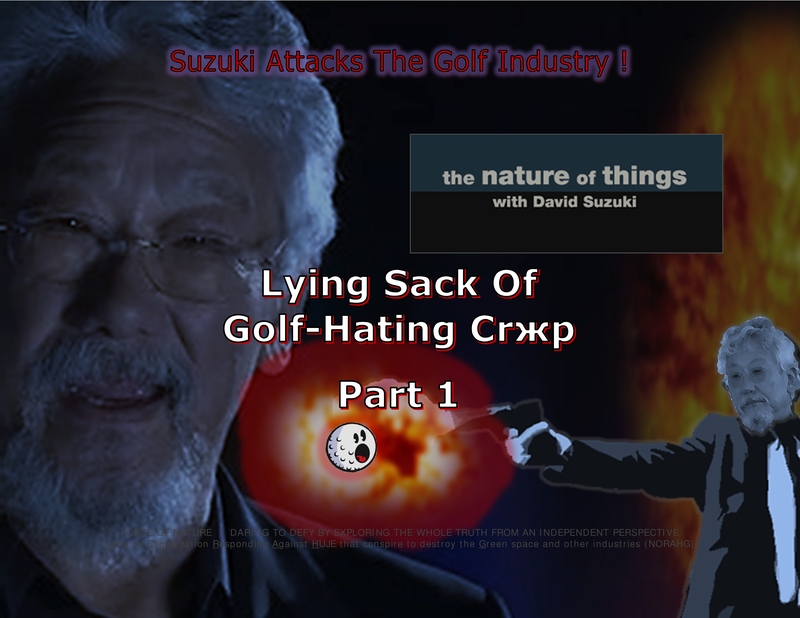 Is David Suzuki and his operatives a bunch of lying sacks of golf-hating crжp ?!?! Through their LIES, David Suzuki and his fanatical-operatives are leaving a legacy of alarmed & enraged golfers, terrorized & destroyed golf facilities, lost jobs and hardship for golf employees, and weakened communities. PEOPLE ARE NOT HARMED BECAUSE OF PESTICIDES USED ON THE GOLF COURSE ! It tells the story of a cancer-patient named Nisker, a golfer who played six days a week, who died from non-Hodgkin’s lymphoma, and who, seemingly, never had a health problem. To him, playing golf was a natural, healthy hobby. CANCER-PATIENT NISKER WAS NOT HARMED BECAUSE OF PESTICIDES USED ON HIS GOLF COURSE ! The #@! !% Suzuki-documentary’s exploitation of death is truly a cheap shot, merely designed to alarm and infuriate the public against the golf industry. Sadly, rather than honor the death of cancer-patient Nisker, who was the father of one of Suzuki’s operatives, it was decided to exploit disrespectfully exploit the death with LIES about the cause in order to alarm and enrage the public about pest control products. The #@! 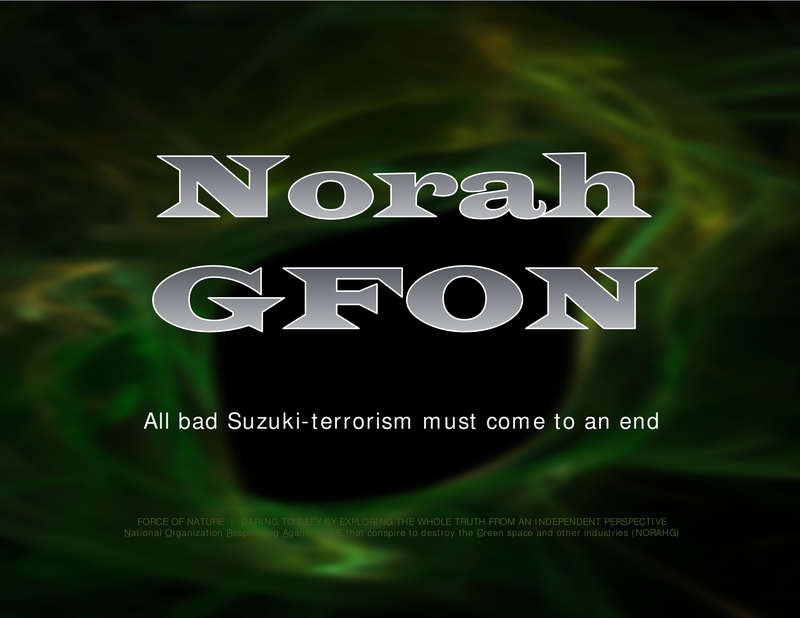 !% Suzuki-documentary exploits death as a weapon of coercion and environmental terror against products that have been clearly shown to be LESS TOXIC THAN Aspirin, baking soda, caffeine, cannabis, nicotine, table salt, and Tylenol. Curiously, photos of cancer-patient Nisker clearly demonstrate that he WAS NOT healthy while he was playing golf ― he looked bloated, fat, pale, stressed, and totally out-of-shape ― the perfect candidate for succumbing to cancer. Perhaps Suzuki should release ALL medical records concerning cancer-patient Nisker, in the spirit of full disclosure. They also want golfers to think about is their unrealistic view of what courses should look like ― rich, green, and unblemished carpets. Even Canadian Cancer Society has STATED REPEATEDLY that scientific research DOES NOT provide a conclusive link between pest control products and cancer. DAVID SUZUKI IS A LYING SACK OF ANTI-PESTICIDE & GOLF-HATING CRЖP ! It tells the story of a cancer-patient named Nisker, a long-time golfer who played six days a week, and who died from non-Hodgkin’s lymphoma. Clearly, cancer-patient Nisker died due to his personal life-style choices. Suzuki and his operatives, nevertheless, started hunting for the most unlikely causes about this particular form of cancer. Their investigation led to the ARRAY OF CHEMICALS [ i.e. pest control products ] being offered to achieve that championship perfection. Suzuki and his operatives ask … can golfers themselves learn to kick the chemical habit ?!?! 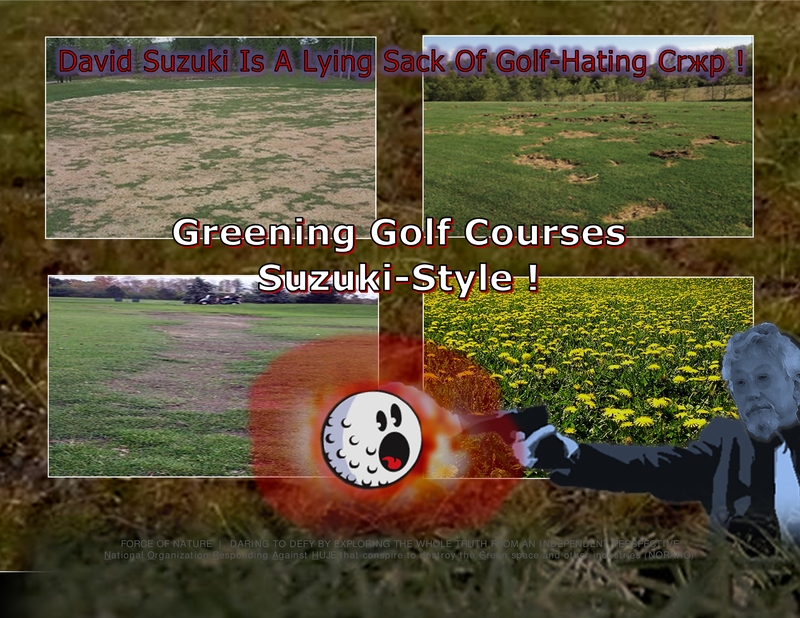 Nonetheless, Suzuki and his operatives attempt to coerce, intimidate, and terrorizing golfers into accepting Greening Golf Courses, Suzuki-Style. In other words, they KNOW NOTHING about pest control products and they KNOW NOTHING golf course maintenance. 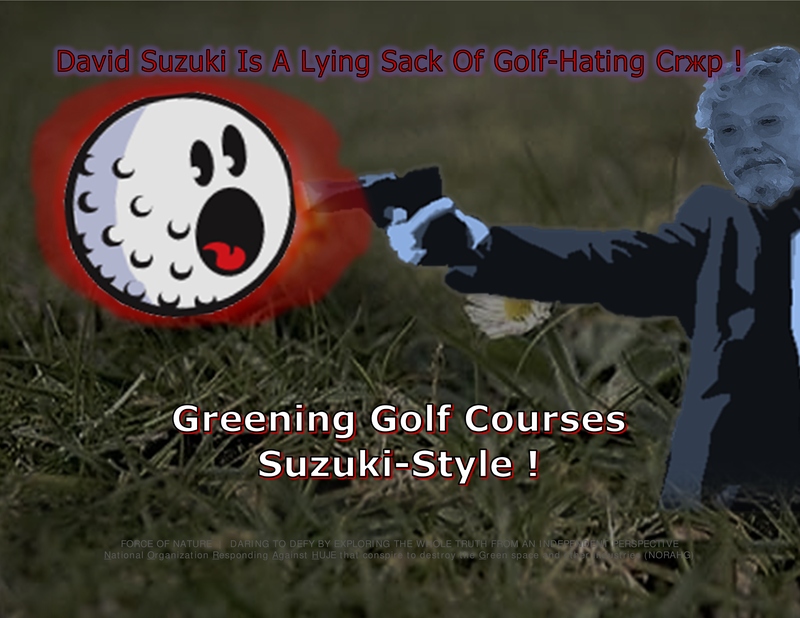 SUZUKI & HIS OPERATIVES ARE LYING SACKS OF GOLF-HATING & ANTI-PESTICIDE CRЖP ! To fight the LIES concocted by David Suzuki, film-maker Nisker, and other fanatical-operatives at Canadian Broadcasting Corporation ( CBC ), you need facts ! If they were not so scientifically illiterate, they would know that scientific research shows that, as reported through EPA’s and Health Canada’s vast toxicology database, NO harm will occur when pest control products are applied properly on golf courses. Of all pest control products, 2,4-D herbicide is the one that they LIE about the most. Overall, pest control products like 2,4-D DO NOT cause cancer. 2,4-D is not only among the most stringently-tested pest control products, it is among the most thoroughly reviewed and re-evaluated. Even Canadian Cancer Society contradicts David Suzuki since its web-sites state repeatedly that scientific research DOES NOT provide a conclusive link between pest control products and cancer. David Suzuki and his fanatical-operatives conveniently ignore the fact that here are thousands of known deaths every year from known cancer-causing life-styles such as unhealthy diet, physical inactivity, excess body weight, alcohol consumption, and over-exposure to the sun. Cancer-patient Nisker most likely succumbed to one these cancer-causing life-styles. CANCER-PATIENT NISKER DID NOT DIE BECAUSE OF EXPOSURE TO PESTICIDES ! Leading Experts Speak Out ! [ … ] NOT ONE REGULATORY AGENCY IN THE WORLD CLASSIFIES 2,4-D AS A HUMAN CARCINOGEN. The U.S. National Cancer Institute [ NCI ] has spent 20 years and millions of dollars testing for any link between 2,4-D and non-Hodgkin’s lymphoma. Its analysis concluded that there is NO ASSOCIATION BETWEEN NON-HODGKIN’S LYMPHOMA AND EVER HAVING USED 2,4-D.
… while some pesticides may present a CANCER RISK to humans, many, maybe even most, PESTICIDES DO NOT. CANCER-PATIENT NISKER DID NOT DIE BECAUSE OF EXPOSURE TO PESTICIDES LIKE 2,4-D ! This organization was established to address the regulatory data requirements of the United States Environmental Protection Agency ( EPA ) and Health Canada’s Pest Management Regulatory Agency ( PMRA ). The Industry Task Force II On 2,4-D Research Data was formed to work closely with the United States Environmental Protection Agency ( EPA ) and Health Canada’s Pest Management Regulatory Agency ( PMRA ). Its role is to fund new research and provide information to each agency as required by their respective pesticide re-registration and re-evaluation programs. The 2,4-D Task Force is made up of those companies owning the technical registrations on the active ingredient in 2,4-D herbicides. They are Dow AgroSciences ( USA ), Nufarm, Ltd. ( Australia ) and Agro-Gor Corporation ( USA & Argentina ). The Industry Task Force II On 2,4-D Research Data has the ESSENTIAL expertise on pest control products. Dr Katherine von Stackelberg, of E Risk Sciences and Harvard Center for Risk Analysis, released a report of a study that determined whether there was any validity to the suggestion from some epidemiologic studies that both 2,4-D and MCPA may be associated with an increased risk of Non-Hodgkin’s Lymphoma ( NHL ), Hodgkin’s Disease, Leukemia, and Soft Tissue Sarcoma. The combined evidence indicates it is HIGHLY IMPLAUSIBLE that exposure to 2,4-D and/or MCPA are associated with a risk of developing NHL or other lymphohematopoietic cancers. The Dr von Stackelberg study on 2,4-D herbicide was published in a peer-reviewed scientific publication, the Journal of Toxicology. I wouldn’t hesitate to let my CHILDREN and dogs play on a lawn where lawn care products have been used as long as the products were applied according to their respective labels. There is NO EVIDENCE that the safe application of agricultural pest control products causes cancer. Pest control products are NOT the leading cause of cancer. Non-Hodgkin’s Lymphoma rates, the cancer most often associated with pest control products, are lower than anywhere else in Canada. Roundup is considered to be among the safest herbicides in the world, and that continues to be the prevailing opinion. CANCER-PATIENT NISKER DID NOT DIE BECAUSE OF EXPOSURE TO PESTICIDES LIKE ROUNDUP ! Suzuki’s operatives visited Saint Andrew’s, Scotland, the birthplace of golf, where the game started out as something very rough and tumble. And they liked what they saw. Saint Andrew’s golf course was kept in shape by rabbits and grazing cattle, and NOT chemicals ( i.e. pest control products ). Suzuki’s operatives also visited Martha’s Vineyard, USA, to find a so-called « organic golf course » ( i.e. pesticide-free ). The Vineyard Golf Club became « organic » because the community insisted on it. Their chosen weed killer ?!?! They LIE and LIE and LIE and LIE ! Clearly, they KNOW NOTHING about pest control products and golf course maintenance. Suzuki and his fanatical-operatives attempt to coerce, intimidate, and terrorize golfers into thinking about cancer if their golf courses have not been maintained Suzuki-style ( i.e. organic and pesticide-free ). This is absolute nonsense ! Suzuki is wrong ! Those golf courses that adopt Suzuki-style maintenance practices will become garbage dumps green spaces and low-end playing. Suzuki-style maintenance will provide playing conditions that are unacceptable and will drive golfers away. Playing surfaces will become thin and yellow, will be over-run with weeds, and will and infested with insects and diseases that destroy the playing surfaces. Without conventional pest control products, golf courses become pest-infested and unplayable garbage dumps. It is impossible for golf courses to keep their facilities playable and beautiful by using so-called green alternative pesticides and practices. Alternative methods of pest control ( i.e. green alternatives, organic pesticide-free maintenance, or IPM-cultural-practices ) are INEFFECTIVE, and CANNOT BE RELIED UPON to properly maintain a golf course. Suzuki-style maintenance golf maintenance is impossible, and can only lead to catastrophic playing conditions and business failures. There will be a lot of unhappy golfers, and bankrupt golf businesses, if the golf industry goes Suzuki-style. The maintenance practices used at the Vineyard Golf Club, in Martha’s Vineyard, are seen as a possible template for so-called chem-junkie or chemical-dependent golf courses. Vineyard is somehow seen as some kind of environmental pioneer, with many in the golf industry needlessly attempting to learn its ( failed ) maintenance methods. Vineyard serves as a template for inflicting catastrophic golf employee misery by changing their job description to mere cotton-pickers ! At Vineyard, there is no longer a need to employ golf course technicians with professional training. All they need to know how to do is bend over and pull. Vineyard has other state-of-the-art pest control practices, such as killing weeds with boiling water or vinegar, and removing moss with kitchen dish detergent. When compared to the use of safe & effective conventional herbicides, NONE of these practices are effective for the control of invasive weeds. Additionally, controlling destructive insect and disease pests is impossible. VINEYARD NEIGHBOURS ARE EXTORTIONISTS ! In fact, Vineyard serves as a template for feeding profit to coercive and golf-hating residents who own homes adjacent to this golf facility. In case you’re wondering … what is the cost of membership at the Vineyard Golf Club ?!?! There is a membership cost for ordinary golfers, and a special cost for coercive pesticide-hating residents who own homes adjacent to Vineyard. For ordinary golfers, the initiation fee is 350 thousand dollars with annual dues of 12 thousand dollars. Coercive anti-pesticide residents who own homes near Vineyard have been given, yes GIVEN, millions of dollars in membership benefits, FOR ALMOST FREE. This is the price that Vineyard actually paid to stop pesticide-hating residents from inflicting litigation, coercion, intimidation, and terrorism. As a condition of its original construction, 125 pesticide-hating residents used environmental issues as a pretext to get stunningly cheaper initiation fees and annual dues. Profiteering coercive anti-pesticide residents must be accepted by Vineyard as members with NO initiation fee and annual dues of only 725 dollars. Who says being an pesticide-hating fanatic is not profitable ?!?! To responsibly and accurately evaluate the safety of any product, due diligence requires a toxicologist (s) perspective prior to questioning the validity of approved products by the many teams of scientists at Health Canada. If we are truly committed to curing this terrible disease, our efforts to mitigate the risks should be based upon empirical data and scientific evidence, which simply do not exist. Making a connection to cancer and golf course pesticides, is no more accurate than suggesting a connection to morning coffee, an occasional aspirin, or pinch of salt at dinner time. If we are going to cure it, we need to take a very calculated approach to understanding it’s root cause (s). Realizing there are also inherent risks in everything we do, in my view we must weigh these risks to their benefits as a point of personal choice. Personally, I am willing to accept the risk of watching that cold, crowded hockey game, eating the questionable hot dog, even risking the toxicity of a cold beer between periods. But basking in the fumes of traffic on my way home, know that the risks I took were not unreasonable. The benefits of turfgrass in parks, athletic centers, and golf courses also provide many environmental and social benefits which far exceed the risks ― hoping the CBC will show both sides in its documentary. Vineyard Is Pesticide-Free Because The Community Insisted On It … In Return For Millions Of Dollars In Profits ! Vineyard serves as a template for feeding profit to coercive & golf-hating residents who own homes adjacent to this golf facility. In case you’re wondering, what is the cost of membership at the Vineyard Golf Club ?!?! There is a membership cost for ordinary golfers, and a special cost for coercive pesticide-hating residents who own homes adjacent to Vineyard. For ordinary golfers, the initiation fee is 350 thousand dollars with annual dues of 12 thousand dollars. Coercive anti-pesticide residents who own homes near Vineyard were given, yes GIVEN, millions of dollars in membership benefits, FOR ALMOST FREE. This is the price that Vineyard actually paid to stop pesticide-hating residents from inflicting coercion, intimidation, and terrorism. As a condition of its original construction, 125 pesticide-hating residents used environmental issues as a pretext to get stunningly cheaper initiation fees and annual dues. Profiteering coercive anti-pesticide residents must be accepted as members with NO initiation fee and annual dues of only 725 dollars. Who says being an pesticide-hating fanatic is not profitable ?!?! The maintenance practices used at the Vineyard Golf Club are seen as a possible template for so-called chem-junkie or chemical-dependent golf courses. This is WRONG ! Vineyard is somehow seen as some kind of environmental pioneer, with many in the golf industry needlessly attempting to learn its ( failed ) maintenance methods. This is FALSE ! Vineyard serves as a template for inflicting catastrophic employee carnage by converting it professional labour force into a group of mere cotton-pickers ! At Vineyard, there is no longer a need to employ golf course technicians with professional training. All they need to know how to do is bend over and pull. Vineyard has other state-of-the-art pest control practices, such as killing weeds with boiling water and removing moss with kitchen dish detergent. When compared to the use of safe & effective conventional herbicides, NONE of these practices are effective for the control of invasive weeds. Additionally, controlling destructive insect pests, such as white grubs, is virtually impossible. Yet another half-baked CBC attack at business. Par for the course. Last time I looked, professional golfers who spend every day on extremely well maintained courses are no more likely to get cancer as anyone else. Arnold Palmer died of heart failure at 87, having grown up around golfing and spent practically every day on one. Let science and research play a part in this discussion rather than emotional guesswork. Don’t allow ultimate causes of cancer be passed over by a narrow focus. Be honest. In Canada the pesticide laws and restrictions are extremely more severe than those in the US. Canadian golf superintendents and researchers are diligent in the reduction of pesticide use, working with a wide variety of bio products. Only 1% of all pesticides sold in Canada are used on golf courses. The majority of pesticides in Canada are used in agriculture. Golf courses look good from the air, get down on the ground, you will see a lot of weeds. How does all the beautiful nature that is seen on golf courses, birds, deer, ground hogs, fox, fish, species of all kind, survive if there is, as falsely claimed, that pesticides are applied en masse. Golf courses, as compared to barren land, act as a tampon which filter the run-off before it gets to the air and water. Golf courses also act as a huge buffer for noise pollution. As Andrew admits how little we know about the complex causes of cancer, yet he is ready to single out golf courses as a contributor. I am very sorry for the loss of Andrew’s father, there are many factors which contribute to a person getting cancer. Golf Facilities may be using up to SIX PER CENT OF ALL PESTICIDES. Utter horse bleep, weed killer also kills Bentgrass, which is 60% of my golf course that’s in play. As it is, I only spot spray once per season in rough areas. #fearmongering! A study says that only 3% of fungicides are applied to turf , 97% are applied to fruits, vegetables and other crops, and you were golf shoes while golfing, we don’t eat turf. Cohen.S.Z, 1995 GCM. Golf facilities may be using up to six per cent of all pest control products. Natural landscapes and green spaces within an urban community contain thousands of wildlife species that would not normally be found within a concrete and asphalt jungle. If these spaces were truly this TOXIC, do you think Mother Nature herself would co-habitat and thrive so closely with the avid golfer ? Trout growing in the ponds and bees pollinating the wildflowers, two species highly susceptible to any type of foreign toxins which has been proven by SCIENTIFIC fact, cohabitate within these green spaces. Perhaps Mr Nisker and Mr Suzuki should take a REAL look at the facts concerning Golf Courses and Urban Green Spaces within our communities. We Need A Better David Suzuki Who Will Not Victimize Decent & Hard-Working People ! As a Lawn Care operator for 30 years, I work with these products almost daily in the spring and fall. All my applications are done by hand. I am not the only one that works in this proximity to the products daily. Why are applicators, like myself, not dying at alarming rates of cancer ? This is another emotion based story, not based of the facts. Typical viewer bait for CBC and David Suzuki. This emotional appeal is sure to hit home with many people that have suffered through and lost a loved one to cancer. I am among those that have felt the torment. My father was diagnosed with Non-Hodgkin’s Lymphoma and given less than 100 days to live. He was also told he’d likely never walk again. Today, over two years later he’s walking and is 100% Cancer free ! I’m wondering though, as he hadn’t golfed in decades, how did he get this disease ? The good news is that we were able to enjoy a day of sunshine and nature together in the beautiful setting of the certified Audubon Cooperative Sanctuary golf course where I work. I’m sorry for the loss that others have experienced and realize that not everyone is as fortunate as my family is. I’m disappointed that Dr David Suzuki chooses to focus on sensationalized and emotion driven TV programming over science and the true nature of things. You state how very little is known about the complexities of various cancers and their causes, yet give very little reasoning behind why you target golf courses specifically. In a world where it seems anything can be toxic, this seems like a stretch. Unless he was walking behind a sprayer and being chronically exposed on a daily basis, I don’t see how walking on treated turf could be more harmful than eating food sprayed directly with pesticides ? Why not attack non-organic agriculture? @Josh Olson Yes I agree. The world starve if we relied on organic farming. Let’s look at the potato famine in Ireland many years before pesticides. Funny, when I contacted David Suzuki about a natural spray that I designed to decrease our pesticide application totals by 90% they said they weren’t interested. Apparently this story has more appeal. I certainly hope Mr Nisker took the time to interview Golf Course Superintendents for this documentary. As a professional in this industry with a Bachelor of Science degree, it is my job to provide the best possible conditions, within a budget, while acting as an environmental steward. Also, any pesticides that are applied on a golf course have been tested and approved by the PMRA in Canada and the EPA in the USA along with numerous other independent agencies. They are also being applied under strict guidelines by licensed applicators. In my opinion, if Mr Nisker did not reach out to Golf Course Superintendents for the facts, it completely discredits the biased story he is telling. As an avid golfer and travel writer who focuses on golf courses and golf resorts, I love and appreciate this story. Question : Are ” Audubon ” sanctioned/certified golf courses truly organic ? @Sherel Purcell Audubon Certified does not mean ” organic “. This is an international standard recognizing facilities that have made or are making efforts to be more environmentally friendly. They do not stipulate what can and cannot be done, but it is more about documenting progressions that have been made. Most golf courses could achieve this standard but the paperwork is very extensive and time consuming and there is a monetary cost involved with being recognized. If you enjoy golf so much, why on earth would even remotely like this story ?!?! And who cares about a golf course being organic ?!?! The big issue for you should be adequate playing conditions, and NOT organic nonsense. As irrational, biased, dishonest, corrupt and evil Suzuki and his cronies are, the golf industry has it coming. They threw the lawn care industry under the bus thinking it would save them in spite of warnings that this was exactly what would happen. Since 2008, in a despicable effort to distract activists, government officials, and the public, several golf industry trade associations like Western Canada Turfgrass Association ( WCTA ) and Canadian Golf Superintendents Association ( CGSA ) supported the prohibition and maliciously torpedoed the professional lawn care industry. Are these trade associations operated by idiots ?!?! The golf industry’s trade associations must cease publicly supporting the prohibition against conventional pest control products used in the urban landscape. They must stop torpedoing the professional lawn care industry. Furthermore, everyone in the industry must not lose sight of the fact that golf facilities use up to six per cent of all pest control products. To avoid its imminent demise, and the total loss of all of its conventional pest control products, the golf industry must immediately address the critical issues addressed by David Suzuki and his fanatical-operatives. The golf industry is on a collision course with the looming shipwreck of anti-golf and anti-pesticide terrorism ! The predictions by Mr William H Gathercole and NORAHG about the golf industry’s looming shipwreck were true ! Dying Of Lymphoma Because Of Pesticides ?!?! Should Not Be Allowed Anywhere Near Children !